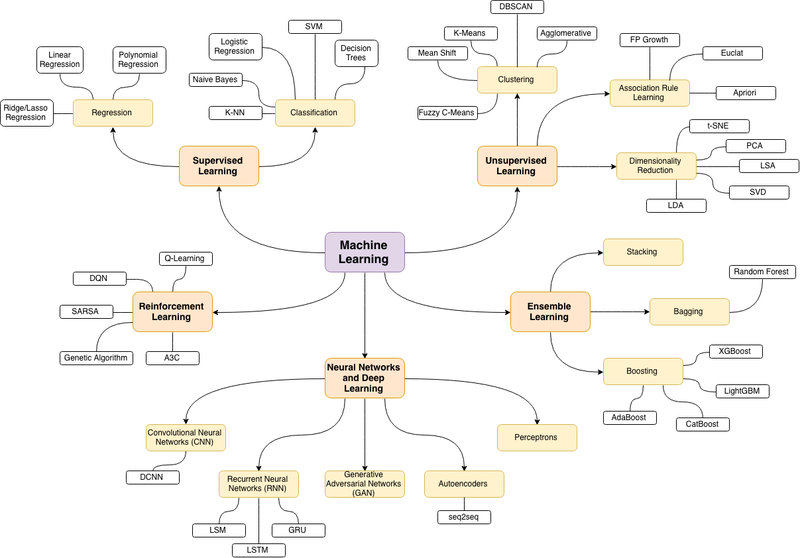 The source of the following machine learning topics map is this wonderful blog post. I’ve recently launched Homemade Machine Learning repository that contains examples of popular machine learning algorithms and approaches (like linear/logistic regressions, K-Means clustering, neural networks) implemented in Python with mathematics behind them being explained. Each algorithm has interactive Jupyter Notebook demo that allows you to play with training data, algorithms configurations and immediately see the results, charts, and predictions right in your browser. In most cases, the explanations are based on this great machine learning course by Andrew Ng. The purpose of the repository was not to implement machine learning algorithms by using 3rd party library “one-liners” but rather to practice implementing these algorithms from scratch and get a better understanding of the mathematics behind each algorithm. That’s why all algorithms implementations are called “homemade”. In regression problems, we do real value predictions. Basically, we try to draw a line/plane/n-dimensional plane along the training examples. In classification problems, we split input examples by certain characteristic. In clustering problems, we split the training examples by unknown characteristics. The algorithm itself decides what characteristic to use for splitting. Usage examples: as a substitute of all other algorithms in general, image recognition, voice recognition, image processing (applying a specific style), language translation, etc.